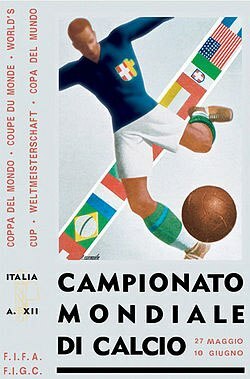 The second World Cup in football took place in Italy between 27 May and 10 June. In total 16 teams were participating after proceeding a qualification phase that had included 36 teams, also the host nation was forced to take part in the qualification. The reigning Uruguay was on the other hand directly qualified, but declined to participate in protest due to the fact many European teams refrained from travel to South America four years ago when Uruguay had been World Cup host. Neither was Great Britain represented with any team since they had decided not to join FIFA. At the time the FIFA World Cup 1934 was arranged Italy, the host nation, was run by Benito Mussolinis fascism party. Il Duce that had founded Seria A (the Italian football club league) a few years earlier, would take the chance to spread some political propaganda and according to some record he had also some influence over the outcome. A day before Italy's match against Austria, he had a dinner with the Swedish referee Ivan Eklind and in the following match there were situations in which the referee could have favored the Italians. Eklind would also be the referee in the final instead for the Belgian referee that had been elected earlier. Even in this match could it be argued that the Italians was favored be the referee. 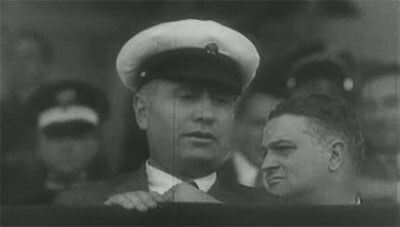 Mussolini watching from the grandstand. The reasons for Uruguay to decline participation was also grounded on political circumstances. Also, Argentina hesitating over their participation and in the end they would partake with an amateur team. The set-up for the competition had changed since the first World Cup in 1930 and the group phase was abandoned for an altogether knock-out tournament format (the group play would be reintroduced again in 1950). If the match was a tie after regular match time a period of 30 minutes extra time would take place. If the match still wasn’t decided after extra time a rematch would be arranged the following day (penalty shoot-out was not introduced until 1978). The matches would be played in eight cities and on eight stadiums (see “Cities and stadiums” box for overview). The final would be played in Rome on Stadio Nazionale PNF that had a capacity of 47,300. The stadium that had its name associated with the fascism, PNF was an abbreviation for Partito Nazionale Fascista. Just like the previous World Cup tournament, some matches were stirred up by ruction on the field. The most scandalous scenes were probably when the Hungarian players surrounded the referee after the match against Austria and blamed him for their defeat. The Quarter-final between and Italy and Spain, was another extraordinary event, with a mix of extreme brutally (including several fights) with top class football. After a draw a replay would follow, which Spain lost. The Spanish goalkeeper Zamora was out of service in the second match due to all mean treatment from the Italians in the first match. In Uruguay 1930 all teams had used the 2-3-5 formation. In this World Cup two different systems would be used: W-M and the Metodo. The metodo, with a sort of 2-3-2-3 formation were developed the Italian coach Vittorio Pozzo and turned out to be most successful. Italian players before the game with an Italian flag. FIFA World Cup 1934 would give the audience lots of goals. In total 70 goals was made in only 17 matches, 4.11 goals per match. One player was sent off during the tournament. First round, places 9-19: United States, Brazil, France, Egypt, Romania, Netherlands, Belgium, Argentina. Quarter-finals, places 5-8: Spain, Hungary, Switzerland, Sweden. In the match of third place Germany would beat Austria with 3-2. 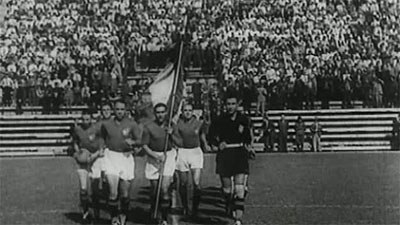 The final was played between Italy and Czechoslovakia. Czechoslovakia would take the lead in second half, but Italy would equalize and extra time would be needed to decide the outcome. 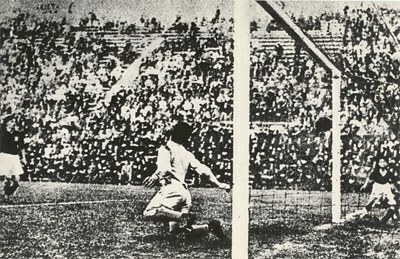 Five minutes into the extra time Angelo Schiavio would score for Italy and the match would eventually end 2-1. Schiavio score the second goal for Italy in the final. Italy would be granted as the second World Cup champions.